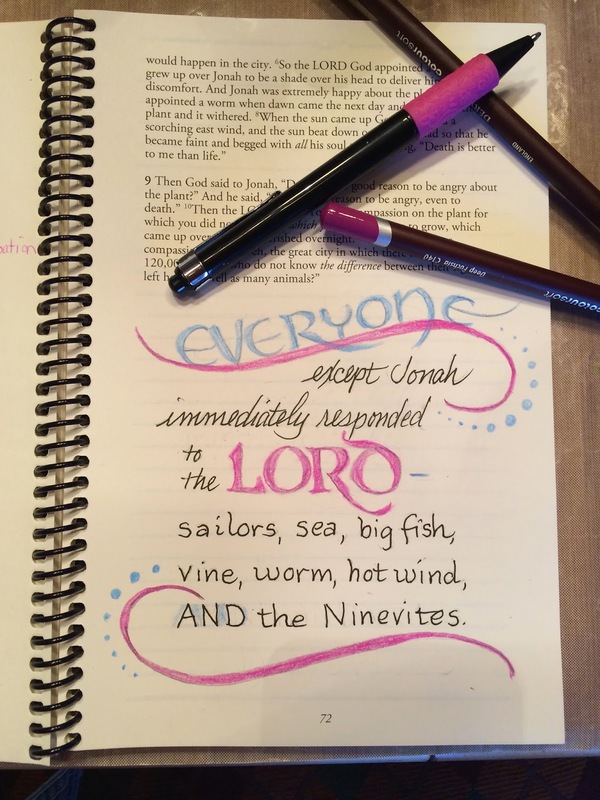 Last year, a group of Bible study friends began a Women's Bible Journaling group with a really interesting study of Jonah.....such a rich book of the Bible!! We decided to continue this form of Bible study by following our church's weekly messages given by our Pastors. To me this is a natural way to journal......carrying throughout the week the thoughts we pondered at Sunday services. Our next theme was The Great Physician.......we journaled in our Bibles and/or notebooks. I tend to take notes during the sermon, then listen to the message again, read the scriptures relating to that message, and put notes and artsy sketches in my notebook. The artsy part may be clipart, something I've sketched, or embellished lettering. Our group renewed our meetings last month - usually the 3rd Saturday of the month, alternating between my home studio and church. The recent sermon series was "In Everything.........Pray" so we are spending a couple of sessions on that theme. We'd love to have you with us. We're out of sync this month so we are meeting this Saturday, Nov. 7 from 1 - 4 pm in my home studio. If you would like to join us, please send me an email: candice@mac.com. This is the type of study that you may join at anytime. I usually have extra material but it's nice to know you'll be there so I can be certain you have everything. Just bring your Bible, some colored pencils, regular pencil, eraser and a composition notebook or any notebook you'd like. I will provide everything else. Bring your lunch or a snack if you want, dress comfortably and if the meeting is in my studio, we may get messy with paints, etc. Dress warm in the wintertime. I think you will find that this way of being in the Word is so meaningful because you linger a little longer. If you aren't in the Rochester, Michigan area, I encourage you to find an online Bible Journaling group or one in your area. I will add some links to the tabs at the top of this page soon to help you on your way! thanks for sharing and I am adding your encouragement in groups today!